Michael O’Hanlon has an opinion piece in USA Today that reminds me of the old Democratic party that I used to support. The first Democrat I remember is Harry Truman and what I remember about him is that he gave ‘em hell. 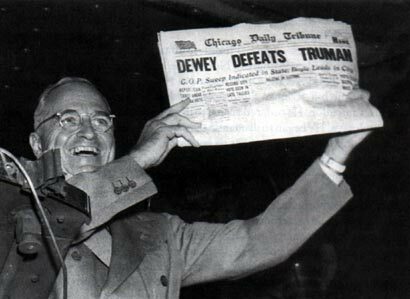 Truman earned that1948 victory grin in the last campaign to be fought from the back of a train – one ‘whistle stop’ at a time. He gave ‘em hell in Greece, and Berlin and Korea, but the most important thing he did was put the Marshall Plan in place which rejuvenated Western Europe economically and eventually led to both the erection and the destruction of the Berlin Wall. It was Michael O’Hanlon who published A War We Might Just Win in the NY Times with fellow Brookings Institution academic Kenneth Polack back at the end of July. I argued then and still believe that because the authors are Democrats working for the leading liberal think tank and publishing in the leading liberal newspaper that the article will prove to be a critical turning point in the Iraq war just as Walter Cronkite’s declaring Vietnam a quagmire was a decisive change in narrative in1968. Four months later (full article here) O’Hanlon is still trying to warn the Democratic party of the dangers of trying to sell the quagmire narrative to the American people. Rarely in U.S. history has a political party diagnosed a major failure in the country’s approach to a crucial issue of the day, led a national referendum on the failing policy, forced a change in that policy that led to major substantive benefits for the nation — and then categorically refused to take any credit whatsoever for doing so. This week, 16 U.S. intelligence agencies published a report that “in fall 2003, Tehran halted its nuclear weapons program.” Turns out the White House was aware of this shocking assessment for a few months, but reportedly worked to delay its public release. Distortions and manipulation to promote a narrow ideological agenda is nothing new to the Bush Administration — it’s how they misled us into Iraq. This is the worst kind of leadership: a dishonest appeal our base emotions. My problem isn’t that Dean is spinning the release of the intelligence report to maximum advantage – that’s his job. My problem is that he is still trying to sell the idea that Bush is simply fear mongering. 9/11 was real and demanded a response. It still isn’t clear what the best response might have been, but one thing is clear. After a long and difficult time in Iraq we have managed to find a way to make significant progress there. We have actually made allies out a Muslim group that was absolutely opposed to us – Saddam’s very own power base – the Sunni tribesmen of Anbar province. As a keen observer of the unfolding of the war in Iraq, the Anbar Awakening is to me the single most important accomplishment of the entire struggle because it isn’t just a victory of arms, it is recognition by Muslims of the real nature of al Qaeda. ‘Godless thugs’ as one former insurgent put it recently. Furthermore, I have serious doubts if Bush without the Democrat’s 2006 victory would have seized to opportunity as decisively as he has. Remember Petraeus, who is reported to be a Democrat, was sent with unanimous Congressional support. Whether they want it or not, they deserve some of the credit. They would be fools not to take it.